After a very long weekend, the “Make an Offer” feature is now live! 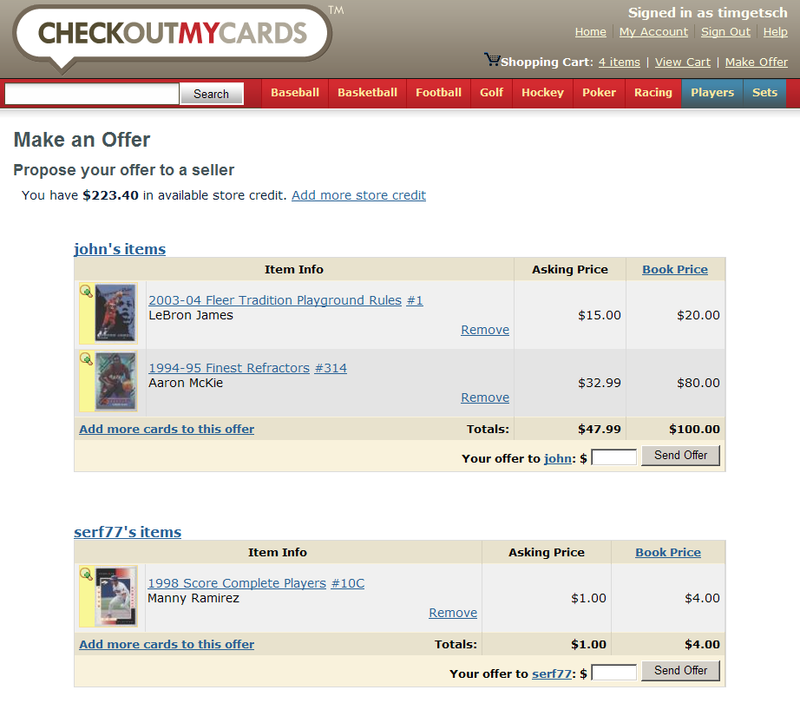 On our Card Details pages you will find a new Make an Offer button. To make an offer you can start by either clicking the new button shown above or by adding items to your shopping cart and then clicking the new Make Offer link on the top of the page or on the shopping cart page. After you log in you will see a page like this. Simply enter the amount you would like to offer the seller and click Send Offer. You must already have enough store credit in your account to cover the offer. The funds to cover the offer will be set aside until offer is accepted, rejected, or canceled. Here is an example of what the Available Store Credit section of your dashboard might look like while you have some pending offers. The seller is immediately notified when the offer is placed. Offers automatically expire after 3 days. While the offer is still open, the seller can accept or reject the offer and the user that created the offer can cancel it. When the seller accepts the offer, the funds are transferred into the sellers account and the cards are transferred into your account. If the seller rejects the offer or if the user cancels the offer, the funds that were locked will be released and no cards will be transferred. In the near future we will also allow the seller to make a counter offer. Until then, enjoy! This entry was posted in new features, shopping cart. Bookmark the permalink.